Jan 30, 2012 In: To Do List Tags: Art Murmur, Mills College Art Museum, Oakland, Oakland Museum of California, Questions Bridge, The Great Wall Film Screenings By: ArtSource Inc. Since the New York Times recently listed Oakland as number 5 on their list of 45 places to go in 2012, we thought we’d highlight art to see in the town across the Bay. 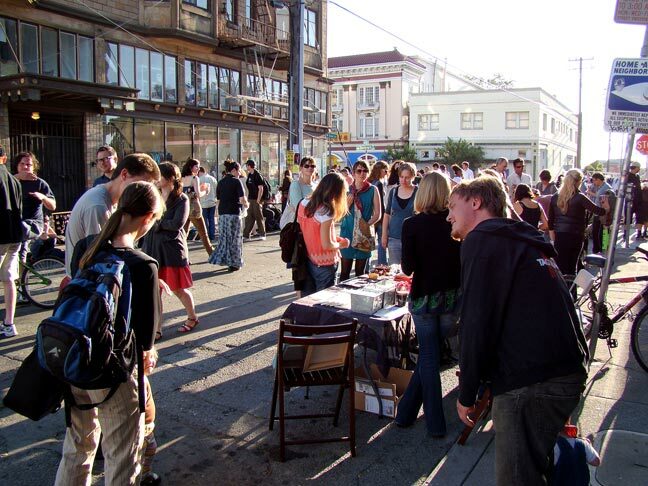 Friday 2/3, 6-9 pm Oakland Art Murmur First Friday Telegraph between 22 – 25th Street: Every First Friday of the month about 20 galleries located within a few blocks of each other in Oakland’s Uptown neighborhood stay open late. The galleries overflow with people onto the Street to watch performers, and to eat from the many food carts that also set up in the area. Less crowded is the Saturday Stroll when the same galleries are also open every Saturday from 1-5pm and often have the artists present to speak about the work or offer tours of the exhibits. Friday 2/3, 7-11pm, The Great Wall film screenings, West Grand Avenue between Broadway and Valley Street: Every First Friday during the Oakland Art Murmur, the Great Wall of Oakland, a 100′ x 100′ projection installation illuminates the Uptown District with cutting-edge motion art from around the world. For February the theme is All About Love. Friday 2/8 & 2/25, 7:00 pm Mills College Art Museum Lecture Series, Danforth Lecture Hall, 5000 MacArthur Blvd. : Los Angeles based artist Jennifer Steinkamp uses computer animation and new media to create projection installations that explore architectural space, motion and phenomenological perception. On February 8th she will give a lecture about her work. Then on Thursday 2/25, Apsara Diquinzio, assistant curator of painting and sculpture at SFMOMA will be featured in the Mills College Art Museum lecture series. Jennifer Steinkamp, Madame Curie, 2011 installation at the San Diego Museum of Contemporary Art. Ongoing to July 8th, Oakland Museum of California, 1000 Oak Street, Question Bridge: Black Males: This innovative video installation was created by artists Hank Willis Thomas and Chris Johnson in collaboration with Bayete Ross Smith and Kamal Sinclair after traveling around the country interviewing 150 Black men in eleven cities. They created 1,500 videos of conversations with men representing a range of geographic, generational, economic and educational levels. Then wove the conversations together to simulate a stream-of-consciousness dialogue, allowing important themes and issues to emerge, including family, love, interracial relationships, community, education, violence and the past, present and future of Black men in American society. 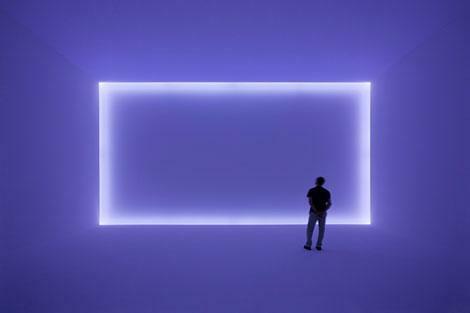 Jan 27, 2012 In: Exhibitions Tags: California Light and Space, Doug Wheeler, Isaac Julien, James Turrell, Larry Bell, Robert Irwin By: ArtSource Inc. Phenomenal, is an exceptionally beautiful exhibition at the Museum of Contemporary Art in San Diego. It is open for a few more days (until 2/5) in the San Diego buildings, but is closed in the La Jolla location. The exhibition is an opportunity to see the stars of the California Light and Space movement. Downtown is a work by Doug Wheeler who was recently profiled in the New York Times, as well as outstandingly displayed work by James Turrell, Robert Irwin, Larry Bell and others. 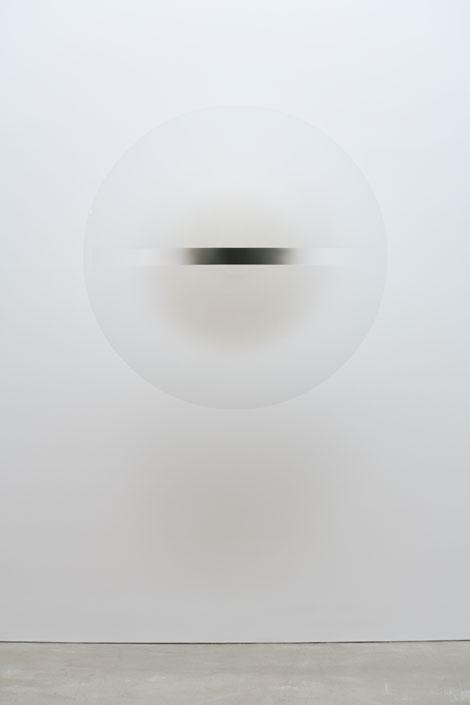 The opportunity to see an Irwin acrylic disk, not lit by the 4 lights that are normally used, but rather simply and perfectly solely by natural light from the skylight above is memorable. Coming up in San Diego, again in all 3 of the buildings is Isaac Julien: Ten Thousand Waves, an exhibition we saw and thought was great when it was in Miami.